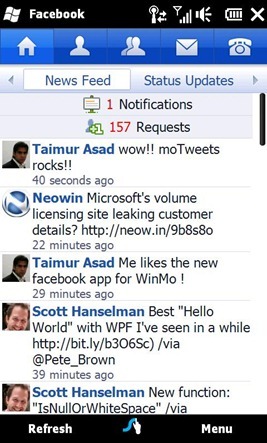 A new version of the official Facebook app for Windows phones has been released on OpnMarket. This latest version 1.1.0.14 brings the ability to Like/dislike, comment, view comments, notifications and search functionality to Windows phones running Windows Mobile OS. This app is currently not available on Windows Marketplace for Mobile. You will have to download and install it from OpnMarket – a freeware alternative to Windows Marketplace. Simply point your phone to http://www.freewarepocketpc.net/opnmarket via the built-in web browser to install OpnMarket. Facebook 1.1 can then be installed from this free marketplace for apps.